Marco, you are originally from Turin. How did you come to be interested in paintings? My approach was unanticipated. It began when at the age of 18 I had to prepare a speech for a school visit to the Uffizi in Florence. I was intrigued by the mystery and symbolism of the story and meaning behind a painting. As I studied the famous portrait of the Duke of Urbino by Piero della Francesca in the Uffizi for the presentation to my class, I wondered why the portrait was in profile. It fascinated me to learn that the Duke only had one eye. Obviously, the most flattering way for the artist to portray him was to paint him in profile. It’s a very simple example of how learning and research reveal layers of meaning. It is what inspires me to study, research and understand a picture. The great Italian Renaissance connoisseur Bernard Berenson was my inspiration. His biography sat at my bedside table throughout the beginning of my career. Ironically, he was not a fan of the Baroque. I completed a PhD at the university of Turin in the history of art. While I was there I had the opportunity to study with extraordinary Italian art historians, including Andreina Griseri, Giovanni Romano and Enrico Castelnuovo. Where and when did you buy your first painting? While I was at university I bought an unattributed painting for my father in an art gallery in Turin. It was my first discovery. When I saw the picture it struck me that it was similar to the work of the Sienese painter Bernardino Mei, whose paintings I had seen in an exhibition in Siena a few years prior. When I found the signature ‘BM’ on the lower right side, I knew that my instinct was spot on. And then, while researching it, I found it documented in a guide to Sienese paintings written by Ettore Romagnoli. It was a heady moment for me as a young man in his early twenties. How did you realise that you wanted to become an art dealer? By instinct. I originally wanted to be a connoisseur and a collector, but I could not collect on the level of the legendary art collectors like Baron Thyssen, whose collection in Lugano I visited often as a young adult with my mother. I understood that the only way I could possess the greatest masterpieces was to become a dealer. The only distinction between a dealer and a collector is that for the dealer ownership is temporary. You own a masterpiece for one minute, one hour, one day or one year. You can’t own it for eternity. In a way it’s a Casanovian approach to collecting. How did you begin your career as a dealer? 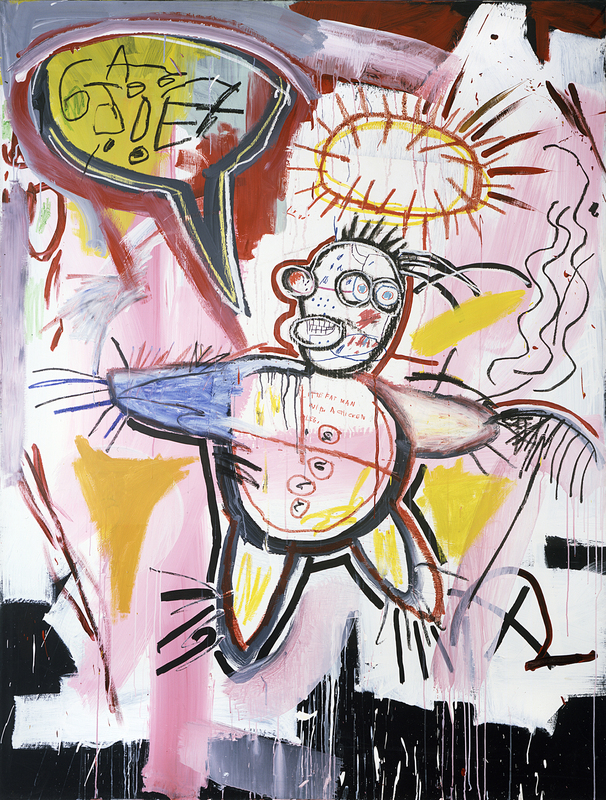 In 1984 at the age of 23 I bought my first painting at auction to sell at Sotheby’s London. 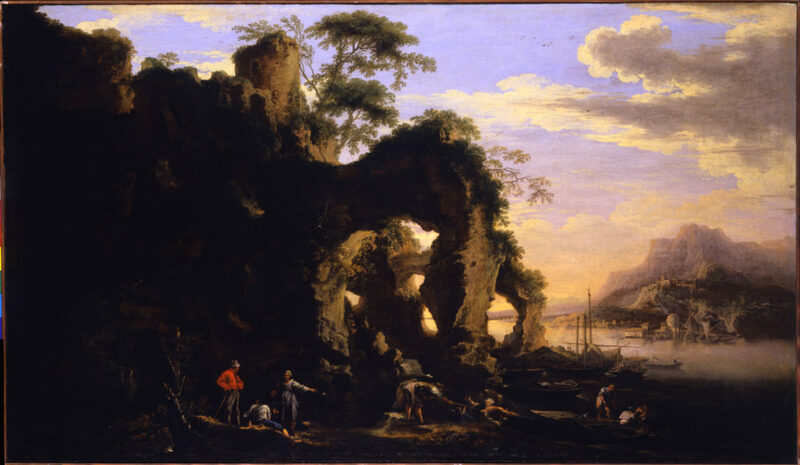 It was a signed landscape by the Baroque painter Salvatore Rosa. A few years later I opened my first art gallery in Turin. I expanded to Milan in 1994, in 2005 I opened a space in London with Edmondo di Robilant and in 2014 in St Moritz. Interestingly, many years later I bought back the Salvatore Rosa landscape for my private collection as a reminder of how it all began. Did you start by being interested in Baroque paintings? Not particularly. At the beginning I was equally interested in Italian, French and Spanish Old Masters, from Gothic through to Neoclassicism. Do you consider yourself a specialist in Italian artists? Now I have come to specialise in Italian art. As an Italian, I can’t help but wave the Italian flag. What attracted you so much to the Italian Baroque,a period in which Caravaggio seems to be the star? It is the ambiguity of the art of the Baroque and of Caravaggio that I love. I don’t like anything fundamental, because life is not fundamental, it is a great poem, and Caravaggio understood that. In many ways it is for the same reason that people respond to Basquiat, who is the “Caravaggio” of today. Both artists straddled the light and the dark sides of the human condition. They were both extreme. It is what enabled both of them to give nobility to different aspects of street life, and in doing this their art exposed deeper artistic truths than the art of their contemporaries. They touched people more universally. But I want to clarify something. I do not believe Caravaggio’s art is Baroque. I believe that Caravaggio instigated the Baroque. It is an important distinction. 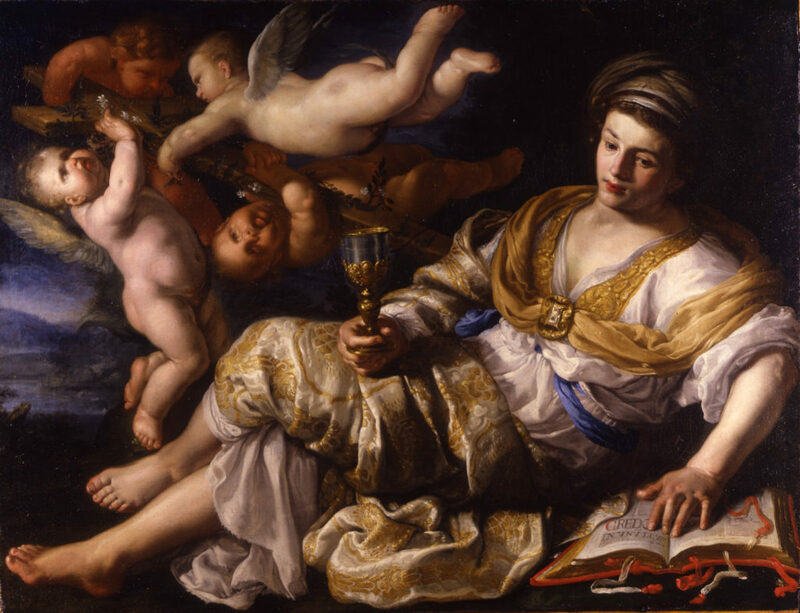 The Baroque period in Rome began in the 1630s. This is explained well in a famous essay by Giuliano Briganti “La Nascita del Barocco”, in Pietro da Cortona o Della Pittura Barocca. The Baroque was also inspired by another great artist who is often overlooked in this discussion, Annibale Carracci. His fresco cycle in Palazzo Farnese in Rome presented a new modernity which was vastly separate from Mannerism. Caravaggio and Carracci opened the door to the Baroque together. Did you become interested in the Caravaggesque at the beginning of your career? Yes, in 1990 I bought a painting of the Holy Family by Bartolomeo Cavarozzi at auction in New York. I sold it to the Istituto San Paolo. This acquisition was the first time that a financial institution in Italy invested in art, in a manner similar to the British Rail Pension Fund collection. Can you tell me about another of your discoveries? In 1992, while riding in a taxi from my hotel to the airport at the close of a trip to New York City, I bid on the phone for a painting that I had just viewed at Sotheby’s. It was a portrait of a man, attributed to Carracciolo, the greatest of the Caravaggisti in Naples. After purchasing the painting I brought it to Turin to have it cleaned. I was shocked by the results. It had all the hallmarks of a Caravaggio. 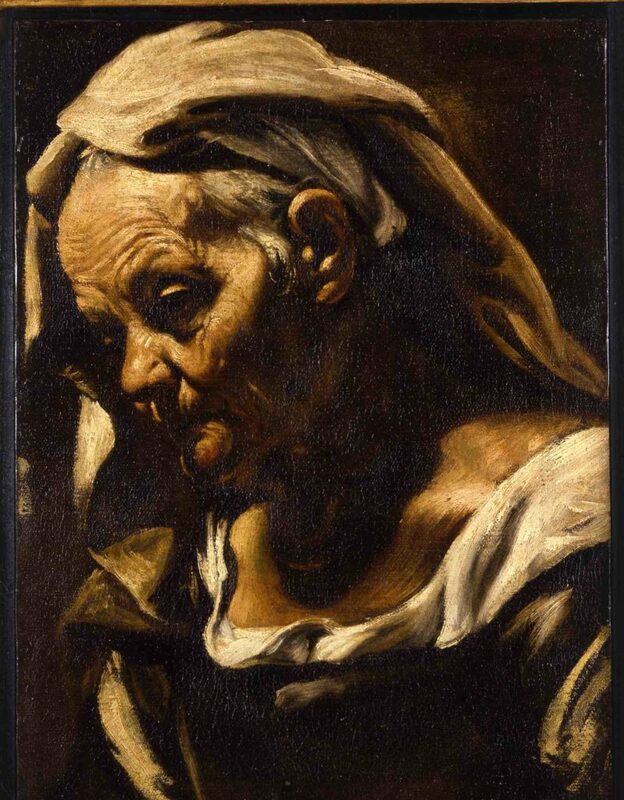 I asked Mina Gregori, one of the great specialists on Caravaggio, to view the painting. She too believed that it was by the master. But I needed an academic consensus to be definitive. I sent the painting to New York to show it to Keith Christiansen, curator of paintings at the Metropolitan Museum of Art, who also agreed. Finally, I showed it to Sir Denis Mahon, who was also confident that it was by Caravaggio. How do you establish that a painting is the original and not a copy? I trust my instinct and my experience. Connoisseurship is underappreciated today, but it is very important. When I hold a picture in my hand, the fine details help me understand if it’s painted by one artist or by another artist; if it is a copy or an original. It comes down to intuition and knowledge. Do you sometimes make mistakes? Of course I make mistakes, but never with the important artists as I am hyper-vigilant when acquiring these works. I do, however, make mistakes with lesser-known artists whose oeuvres I am not as familiar with. This is how one continues to learn. Who do you consult when you have a doubt about an Old Master painting? I still consult Keith Christiansen at the Metropolitan Museum of Art. In this field, he is one of the best art historians and connoisseurs. Early in my career I used to consult Sir Denis Mahon, who revived interest in the Baroque. He did this in a similar way to how Roberto Longhi revived interest in Caravaggio around 1925-1930. Longhi was a great expert of Italian culture who was well versed in Gothic, Renaissance and Baroque art, but the only two artists who impressed him were Piero della Francesca and Caravaggio. As a young man from Turin, how did it feel the first time you sold a painting to the Metropolitan? What does it mean for an art dealer to sell to such museums? I was not brought up in a family of art dealers (my father was a doctor, my grandfather was an industrialist), so the realisation that I am now in a position to offer works that are chosen by curators to hang on the walls of the world’s great museums is an enormous honour. It is also extremely motivating. To have a painting currently on view in the Beyond Caravaggio exhibition at the National Gallery of London, a temple to Old Master art, is as humbling today as it was when I first sold a painting to a museum. Are you driven by your passion for art? Absolutely. If you don’t have passion it is impossible. Art serves as an anti-depressant for me. I’m never depressed. When I need to find my balance, I pick up the catalogue of an exhibition or I go to a museum. With a passion for art you are never alone. You always have some friends in the form of paintings and sculptures to visit. You also think in terms of business, and at the moment it seems that Old Masters are out of fashion? Fashion, of course, is up and down. Old Masters aren’t out of popularity everywhere in the world, because societies change and evolve. Collectors from China, Malaysia, Middle East and Africa are creating new collections, and their tastes don’t follow Western trends. For Western Europeans and Americans, right now it is easier for us to feel and to understand contemporary and modern art, because when things are perceived as bourgeois they go out of taste. And you can’t classify ‘the Old Masters’ as a group when discussing trends, because they span from Gothic Art to Neoclassicism. Besides, anything truly great is never out of style. As for Caravaggio and his world, I doubt that he will go out of fashion as he did in the past. He has become a brand, like Picasso. He is now rightly recognised as one of the iconic artists, a star. Nowadays do people prefer to buy at auctions or in galleries? This preference changes all the time. People who want excitement tend to prefer bidding in an auction, but some people prefer the quiet of a gallery. When doing business with a dealer the pressure and immediacy of buying is missing, and auctions give this kind of adrenaline. You have to win against somebody in a short moment, and if you fail to win that work of art the moment of regret can be long. Some people also prefer to buy at art fairs. Buying at a fair is in between buying at an auction and a gallery because, although you purchase from a dealer, the decision needs to be made in a short amount of time. Are Old Masters now mainly bought by museums or by private collectors? Recently the buyers for Old Masters have tended to be museums or foundations rather than private collectors. There are fewer Old Masters collectors than before, but the collectors who are around buy with great passion. What is interesting is that the collectors are not buying for speculation, but for their own satisfaction unlike modern and contemporary collectors. What is interesting is that the collectors are not buying for speculation, but for their own satisfaction unlike modern and contemporary collectors. A friend of mine Leone, for example, has bought around 250 Roman and Neapolitan Baroque pictures over the past 40 years and has not sold one! I feel fortunate to have shared my love for the Caravaggesque with extraordinary private collectors such as Luigi Koelliker. The relationship between a dealer and a true collector can be profound. Do realised auction prices set the pricing for the Old Master market? I’m against the idea that the price one painting makes on a single day should be used as the price for everything by that artist going forward. This concept comes from America. It is like the stock exchange of art. An auction price for a painting relates only to that day, that hour, that moment, for that painting. It in no way relates to the price of another painting on another day. It’s not the same. Is a work by Caravaggio priceless? No, it’s not priceless; that doesn’t mean anything. In the 1980s a Caravaggio was bought by the Kimbell Art Museum for $20 million. There is a range for top-level Old Master paintings by big names with important provenances; it is $30-80 million, not more. How many paintings by Caravaggio are known? More or less 60, and I would venture around 5 -10 are still in private collections. People collect for many different reasons: some for social climbing or upgrading, some for a hobby, some for fantasy. Collecting can be a great escape for people who have difficult work lives or for people who live far away from cities with great museums like Paris, Rome or London. Art is a way to step out of routine. As I said before, it is antidepressive. It gives life to everybody when there is something missing. We can collect and feel free. Art is a key part of every day of our lives and, just as you have to eat every day, I say that you also need a meal of aesthetics every day. Are collectors from the younger generation interested in Old Masters? I am an optimist when it comes to the younger generation, but in a way I don’t think about whether or not they are interested. I try to convey the power and importance of art. So my primary concern as a dealer of Old Masters is to try to find part of our art historical past that is lost. Everything we find from the past is important to our present and our future. What motivated the British aristocracy to collect superlative Italian works of art? These aristocratic families in the 17th and 18th centuries became so rich that they could afford to collect anything. They travelled all over Europe on their Grand Tours. When they saw Rome and the palazzos of the princes and the popes, first they wanted to recreate that magnificence and then they fell in love with the art and the beauty. And it is difficult to challenge the extraordinary beauty that came out of Italy during this time. Economic power comes first and culture follows. If you can afford it, extreme beauty is what you want to have around you. And beauty is ultimately the same for everybody if they are willing to look for it. When humans create something beautiful, it is astonishing, whether it is a small object, or furniture, or a painting, or a sculpture, or architecture. No one is immune to its allure. Despite your long lasting interest and knowledge of Caravaggio and the Old Masters, you are also interested in contemporary art? I like contemporary art. In fact, I bought my first contemporary piece, by Gilbert and George, in 1996. Contemporary artworks are, of course, the Old Masters of the future. Today the great artists of the 20th century, from Picasso to Fontana, have already become Old Masters. What is difficult about contemporary art demands is that it takes an enormous amount of attention, because it has not been filtered by the judgements of time. To truly understand it one must be an active collector, and constantly watch to determine what is happening and what is coming next. What is wonderful about contemporary art is that the artists are always one step ahead of the rest of us. Do you see a fil rouge between Old Masters and the works of contemporary artists? Absolutely, because it’s always related to the mentality of the Old Masters. Every artist looks to the past. You seem to be personally very much involved in the design and layout of your exhibitions. Is presentation a very important part of an exhibition? I believe every detail is important, including the way you display things on the wall, or frame them, no matter whether they are in a public exhibition or on private display. I think a lot about how to exhibit works of art, and I believe I was one of the first to juxtapose works of art from different centuries around a common subject or theme. The first exhibition that I organised of this type was in collaboration with Gian Enzo Sperone in New York City and Milan in 1999 when we combined Italian gold ground paintings with gold paintings by Lucio Fontana. In Fontana you have the same mystical notions as Italian religious paintings from the 14th/15th centuries. This concept is what Frieze Masters was built upon. Do you have the same aim and passion today as you had when you started as a young man? Absolutely, but it is a bit less romantic than it was before. It used to be more simple, more pure. Today it’s more complicated because the art world became a business, and like any business it doesn’t always cater to your initial intentions. My intention was to be free to discover, to study and to buy and to sell, but in a very simple way. It matters most that great works of art still pass through my hands, if only for a minute, an hour, a day or a year.